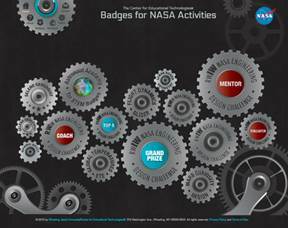 The new Badges for NASA Activities website offers as much fun as the many NASA learning opportunities featured there. Cassandra Lightfritz, graphic designer at the Center for Educational Technologies, and computer programmer Chris Ruckman teamed up with project leader Dr. Meri Cummings, science resource teacher at the center, and Bob Starr of NASA Langley Research Center in the site's design. The site offers an innovative gateway (think lots of moving parts!) to a number of educational activities in which students can earn digital badges from the space agency. The Center for Educational Technologies partnered with software developer Project Whitecard on the badging project, which was funded through a $150,000 grant from the John D. and Catherine T. MacArthur Foundation and Mozilla software. The project creates badging opportunities using existing robotics and other exemplary STEM resources from NASA.